Ingredient List: Gluten Free Flour Blend (Sweet White Rice Flour, Brown Rice Flour, Potato Starch, Whole Grain Sorghum Flour, Tapioca Flour, Xanthan Gum), Sugar, Baking Powder (Sodium Acid Pyrophosphate Sodium Bicarbonate, Corn Starch and Monocalcium Phosphate), Sea Salt, Natural Vanilla Powder (Sugar, cornstarch, Vanilla Extract). Test Kitchen Overview: We are fans of Bob’s Red Mill products in general. They are consistently high quality. The breadth of their offerings continues to grow and we especially like their minimal packaging. While we often turn to them for whole grains – rice flours, sorghum, amaranth, cornmeal and others – we have been watching them closely recently, monitoring their blends and mixes. For years they offered a gluten-free flour blend that had a fairly high garbanzo bean content and it tasted a bit “beany”. When they came out with their Gluten Free 1 to 1 Baking Flour, which was a whole new all-purpose GF flour blend, we took note. This was a company that was dedicated to specialty baking needs. 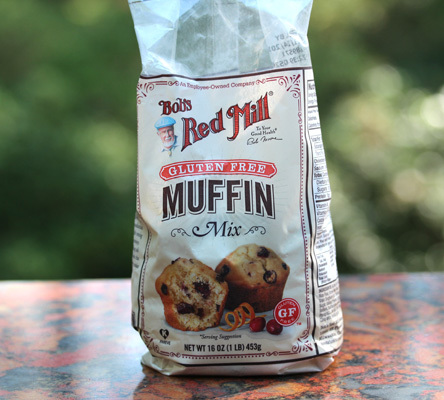 They have been adding more and more blends and mixes and this Bob’s Red Mill Gluten Free Muffin Mix is a great example. The mix is dairy free as well as gluten-free, making it versatile for those wanting to steer clear of dairy. The mix is easy enough. Simply add vegetable oil or melted butter, milk (or non-dairy milk), egg and add-in of choice. We went for classic blueberry. Pros: Easy to use. Versatile in that we had a choice to use milk or a dairy-free milk option. (Note that the package only calls for cow’s milk but we have had great success with almond milk and coconut milk from the carton). 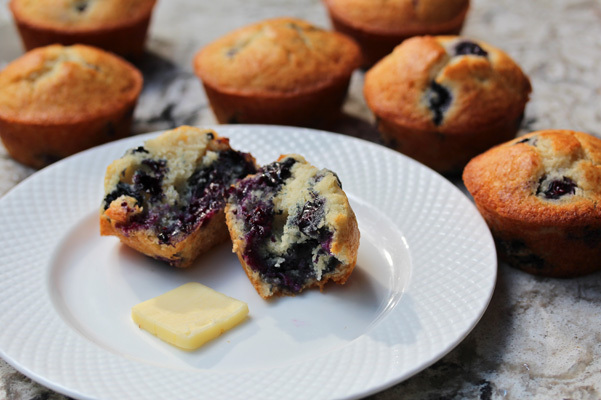 The muffins pictured used whole milk and melted butter and 1 ½ cups fresh blueberries. Batter was ready to go into oven even before oven finished pre-heating. The flavor of the batter is basic but still flavorful (see the vanilla mentioned in ingredients) and would work with all kinds of dried fruit, nuts, other fresh fruit, etc. Cons: We like the minimal packaging because we transfer dry goods to airtight containers and suggest that you do too. Their bags are not re-sealable, so this may be a negative for you. Suggested Use: Great to keep in the pantry for near instant muffins. Where to Buy: From Bob’s Red Mill’s site or in stores near you. The site also has a store locator.